Cue the epic music; here comes The Ninja. 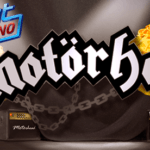 Having released this title simultaneously with Satoshi’s Secret, Endorphina has been unleashing solid titles in the past few weeks which have been rocking the online slots industry. Inspired by 1980s action movies heroes this title has a unique appeal to it along with a solid bonus round similar to Who Spin It but with the added benefit of having higher payouts in accordance to how much money you’ve put in to activate it like SugarPop. The Ninja has special features that you would expect of any standard slots game but still feels like an original title regardless. 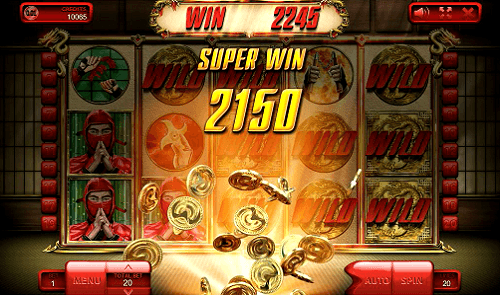 The Ninja slot - Super win! 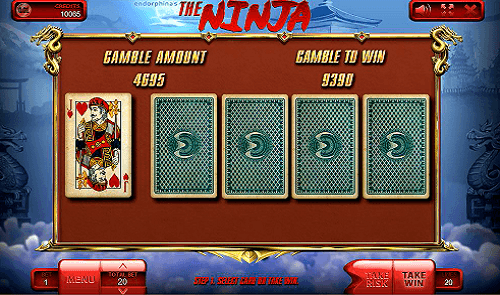 The Ninja is a 5 reel, 3 row and 20 payline slots game. The animations may look a bit mechanical and unpolished but the gameplay itself does a decent enough job of making up for it. The background consists of moonlit mountains with dragon statues and ominous fog that gives the game the proper ninja feel. The music is definitely pretty epic and is one of the few games we decided to not mute after 20 seconds of spinning. The sound effects sound very 1970 and 80s-like intentionally but it doesn’t work too well in combination with the animation style to give it that 80s feel. There are two main types of reels you can hit: ninjas and their weapons. Ideally you want to hit ninjas as opposed to their weapons because they pay out significantly more. The blue ninja is the most valuable in regards to payouts while the red and yellow ninja pay out equally. It’s the black ninja you’re really after though as every time you hit one it is converted into a scatter/wild reel. 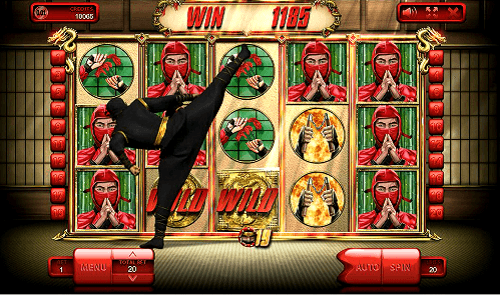 Every time you collect 2 black ninjas on any payline you will notice that a number on the bottom of your screen appears with a black ninja next to it. This is referred to as the WILD Accumulator and it accumulated in accordance to your current total bet. This means if you chance your bet sizing you will lose your accumulated ninjas so be careful! This number is used for the bonus round which we will discuss shortly. Unlike Satoshi’s Secret, this game only pays out left-to-right which is a bit of a letdown. 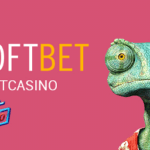 However, the game does give the players the highest payout on each payline unlike many other slots titles out there which pay out the lowest. Our biggest complaint is that the normal rounds do not pay out very well unless you hit several wild reels. Less than 10% of our spins were winning spins and even when they were, it was for a fraction of our bet. It seems that the real focus in The Ninja is the bonus round and making enough money off of it to make playing the game a profitable decision. 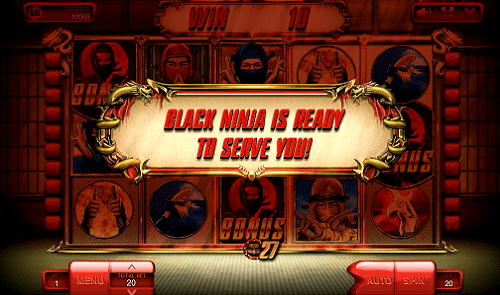 The bonus round gives players several free games and is activated when you hit three black ninjas on any reel. 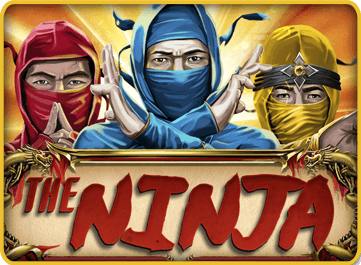 The Ninja gives players a slightly more unique bonus round as opposed to other titles because free spins last until you run out of your accumulated WILD ninjas. When you reach the bonus round, a black ninja appears on screen and pummels reels after each spin until they become wild but only for reels 2, 3, 4 and 5. Each punch or kick the black ninja takes on each reel will cause your WILD Accumulator to be reduced. 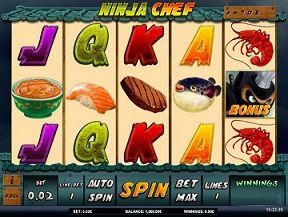 Since the ninja can pummel all four reels after any free spin, you can easily rake in some cold hard cash if you get lucky. Once the ninja pummels enough reels to cause the WILD Accumulator to run out, the bonus round ends and you are returned to standard gameplay. If you like to gamble, you can always take a chance on winning extra money using the risk game after each and every spin. The risk game is the standard “pick a hard higher than the dealers” and lets players attempt to double their winnings up to 10 times. Players who like to play it safe and take their money and run should take note to not use this round unless they feel lucky! The Ninja is one of the more epic titles to come from Endorphina and has a unique feel to it. While the software company claims that it was inspired by 1980s action movies it doesn’t feel that way. While we’ve never been a fan of the risk game, it is there for those who prefer it. The bonus round is what you really want and generally you will achieve it once you’ve accumulated approximately 10 black ninjas. 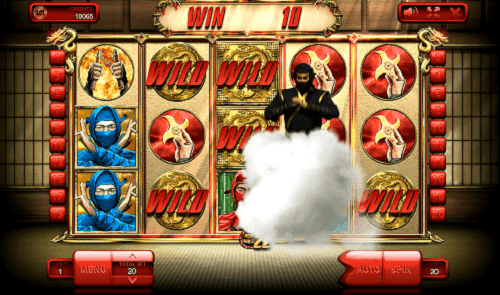 Overall The Ninja is an enjoyable slots title although not as impressive as Satoshi’s Secret. Adding in an extra bonus round would have made this game a lot more appealing, especially since the spins leading up to the bonus round are almost always duds. 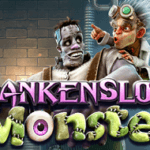 Still, we recommend checking out this title and playing until you hit the bonus round because you can win big easily enough. If all else fails, at least the music is catchy. Where can I play The Ninja?